This post was originally written in 2014. I’m updating it now in September 2018. In February of 2013, I was interviewed by Alen Standish of the Quit Binge Eating Podcast (now called the Progress Not Perfection Podcast). Alen, who has been a colleague and personal friend of mine since the time of the interview, now has a newer podcast called the Inner Effort podcast. He’s not only a great podcast host and an inspiration to many, he’s a media and production consultant and developer, and I owe the launch of my own podcast to his expert advice. Even if you don’t read this entire post (I know I can be wordy! ), check out the bottom to read about an exciting project that Alen and I have been working on, which we believe will be very helpful to binge eaters and those of you who struggle with other problematic eating habits like overeating, emotional eating, and night eating. Alen: You cautioned in Brain over Binge that you are only focusing on how to stop binge eating and are not addressing any other underlying problems a person may be having in their life. In my own case I actually had to work on several areas of my own life to better round myself out before I was ready to fully take on stopping my own binge eating disorder. Your book was a large part of that, but it only worked for me because I was ready for it at that point in my life. Based on my experiences and this is just my own opinion, I find that it seems to be a balancing act that only the person suffering from the disorder knows when they are ready to just say no to their disordered eating, and from that when and where to start their recovery process and most important, how to recover. It’s a very individual thing. What are your thoughts? First of all, I think an important thing to remember when reading anyone’s recovery story, using any self-help program, or even attending therapy, is that you can use what works for you at this particular time in your life, and discard what doesn’t. Sometimes people get caught up in trying to do things exactly “right” or “by the book,” based on someone else’s advice, and it doesn’t end up feeling authentic. My recovery came about from me discovering information that made sense to me and resonated deeply within me (in Rational Recovery), and also from my own insights that followed. 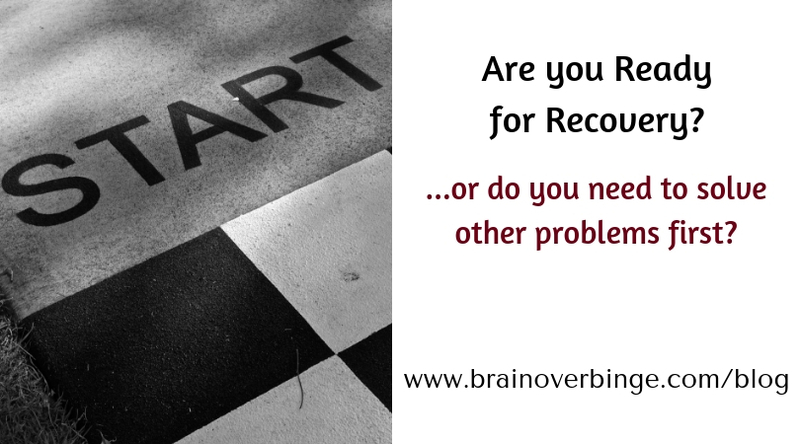 When I read Rational Recovery, I didn’t even consider whether or not I was “ready” to stop binge eating before putting the information and insights into action. I knew binge eating brought me misery, and I didn’t want it in my life; and this was the case since my binge eating began. In that way, I guess I was always ready to recover. Even when I was in therapy and led to believe that my eating disorder served a purpose in my life, by helping me fill some sort of emotional void or by helping me cope with problems, I knew whatever theoretical “benefits” or temporary pleasure I received from the binge eating wasn’t worth the cost. The idea that binge eating was a coping mechanism did, however, make it easier to keep hanging on to the behavior. I spent a long time in therapy and on my own trying to sort out things in my life and solve other problems (some of which I did sort out and solve, some of which I didn’t) for a long time and I thought recovery hinged on that. If Rational Recovery would have been another approach saying that it “might not work if you have other problems to sort out first,” I don’t think it would have helped me. I needed a no excuses approach at the time. I need to learn that I could quit right away without having to do anything else first. In other words, I needed to hear that I was already ready. That was my experience. Alen’s experience was different, but also uniquely authentic to him, and your experience might be different from both of ours. I agree with Alen that recovery is an individual thing and only the person recovering can decide what they need. This is why it’s important to have alternative perspectives in eating disorder recovery, because some ideas will be a better fit for certain people at certain times than other ideas. If you read my book, or attend therapy, or complete a self-help program and you don’t improve even after giving it proper effort and practice, this is not the time to put yourself down or lose hope. It’s the time to determine how to adjust the ideas to better suit you, or it’s time look elsewhere for ideas that feel like your own unique truth and that work for you. Empower yourself to make decisions that are in your best interest. That being said, I don’t believe recovery should be a labyrinth or that you should jump around from one approach to another, without being consistent enough to see changes occur. Recovery can and should keep moving forward. However, there may come a time when you feel like you need to work on another area of your life in order to become ready to move forward, or keep moving forward. I’ve spent some time thinking about a way to merge the idea that some people (like Alen described) might need to work on other areas of their life in order to feel more able stop binge eating, with my approach which does focus on stopping the behavior without needing to address other issues first. I believe that recovery from binge eating comes down to 2 things: 1.) Learning to dismiss urges to binge and 2.) Learning to eat adequately. (If you are new to the Brain over Binge approach and want a better understanding of those goals, you can get my FREE eBook “The Brain over Binge Basics”). You can use those two simple recovery goals to guide you in determining what you might need to work on, in order to make yourself recovery ready. First of all, try not to put conditions on your ability to recover, but I think it’s helpful to work on any specific issues you feel are holding you back from being successful at one or both recovery goals. Basically, if you think that working on another problem or issue in your life will help you move toward those goals, then work on that issue or problem. Of course, you can work on whatever issue or problem you want, as a way to live a better life, but try not to wrap up all of your self-improvement work into your eating disorder recovery. You don’t want to be endlessly trying to work on emotions or solve other problems, hoping that will magically make you feel ready to recover or even take the eating disorder away completely. But, if you stay focused on those two recovery goals, you can tackle recovery readiness with a much more strategic mindset. I’ll give you some examples so you can see how this may play out in real life. Let’s say you have poor self-image, and because of that, you are determined to diet restrictively and lose weight in an attempt to feel better about yourself. That might prevent you from eating enough food, which in turn, will make your urges to binge stronger and more difficult to dismiss. If you feel unable to allow yourself a nourishing amount of food to meet your physical needs, you might need to address your poor self-image in order to move forward. This doesn’t mean a positive self-image is a cure for binge eating; but improving the way you view and relate to your body will help you start feeding it properly, and therefore put you in a position to stop acting on the binge urges. Another example: let’s say you have severe depression that prevents you from wanting a better life for yourself. You don’t have the desire to avoid binges, so you allow the lower brain (the part of the brain that drives binge eating) to overtake you, without even trying to avoid the behavior. You simply don’t have any motivation to let go of the binge eating. Again, improving the other problem (in this case, depression) isn’t a cure, but it will put you in a better position to start overcoming the binge eating. Feeling less depressed will strengthen your higher brain (the part of your brain that can change a habit), and allow you to connect with your desire to live free of your eating disorder. What I’m suggesting, if you don’t feel ready for recovery, is this: Working on the issues you believe are preventing you from eating adequately or dismissing binge urges. What I’m not suggesting, if you don’t feel ready for recovery, is this: Working on the problems/emotions that you feel binge eating helps you “cope with,” with the expectation that an improvement or resolution of those problems will make the binges go away. Sometimes what I’m suggesting and what I’m not suggesting can involve the same problem. If that seems a little confusing, I’ll explain, using anxiety as an example. Let’s say you think you binge to cope with anxiety, so you try address that anxiety by relaxing more and avoiding anxiety-provoking situations. You do this hoping that decreasing anxiety will decrease your “need” to binge. If the binge urges habitually come when you are anxious, this approach might indeed help you avoid some binge urges (which is perfectly fine), but reducing anxiety isn’t truly helping you learn how to dismiss the binge urges when they come up. There are likely other situations where you have urges as well, and it’s impossible to control every situation and feeling in your life. When anxiety inevitably comes up (it does for all of us), you’ll likely find yourself swept away by the urges. The goals is not to make problems go away so that urges will hopefully go away too, the goal is to learn to avoid acting on urges when they do arise. I want to make sure you realize that I’m not telling you to just resign to deal with certain problems. You can absolutely work on whatever issues you want to work on, but as much as you can, keep that separate from binge eating recovery. Otherwise, you could keep working on other problems indefinitely, without getting any closer to accomplishing the two recovery goals. Although I do believe that recovery is an individual thing, I hope that keeping the two recovery goals in mind will help you narrow down what’s necessary for you to do to be ready to end the binge eating habit. I’m excited to be working with my friend Alen Standish, who inspired this post, to create coaching audios that can be delivered to you daily, to keep you focused and motivated in recovery. Alen is the mastermind behind a new media delivery system that will allow you to get the coaching audios via text message, your podcast app, as well as through email. I know this has been a labor of love for him, and it’s been amazing to see this go from an idea to a technological reality. Alen has created a set of coaching audios called “Before I Eat,” which are aimed to help you deal with an array of eating urges—including night eating, overeating, stress eating/emotional eating, and binge eating as well. In this post, I talked about the two recovery goals of dismissing urges and eating adequately, and in the 14 coaching audios that are part of this set, I will coach you through those two goals so that you can stay on track. The coaching audios I’ve created are already part of the Brain over Binge Independent Study Course and the 8-Week Group Course, but with this new practical delivery system that Alen has created, it makes the audios more accessible and valuable. When you receive the audios in text messages each day (or in your podcast app or email), it greatly increases the chances that you will listen to them and apply what you hear. Alen will be on my podcast in November to talk about these projects—he will discuss his “Before I Eat” coaching audios, and I will tell you more about my “Recovery Goals Coach” audios. I’m excited for you to hear about both options, and decide if one or both sets of coaching audios will be a good fit for you. Thank you so much for continuing to follow my blog and podcast!